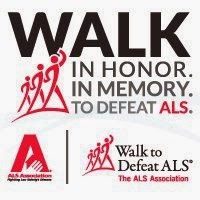 On the eve of the 2013 Walk to Defeat ALS, I'm reflecting on the time and energy we've spent over the last year to raise money and awareness to ALS on behalf of Tony. When we formed the team, we joked that raising $2,000 would be a fantastic goal...yet, as time passed and the donations rolled, in it became clear this goal was not going to stand. We easily surpassed $5,000...$10,000 and then $15,000. Tony would just shake his head in amazement. The love, dedication and empathy pouring in from family, friends and strangers always seemed to lift his spirits despite the changes in his condition. It never occurred to me that Tony wouldn't be here for the walk. Yet here we are a little over a month from his passing and I'm staring at all the pictures of him, his family and the kids he leaves behind. I think about him daily. I wear my ALS bracelet as a reminder of the head-to-head poker hands we played together. I wear it as a reminder of all the times he would offload skunky wine to me. I wear it and chuckle at the pigeons that would 'taunt' him on a daily basis. I hope those of you reading this will add a comment below that captures a memory of Tony and what he means to you. Keep him in your thoughts as friends, family and strangers gather this Saturday to help remember, honor and hope for those stricken with this terrible disease.